The stage was set in Pope Auditorium this past Friday as hundreds of students filed in for Fordham Lincoln Center’s (FLC) annual Winterfest concert event, hosted by the Campus Activities Board. The talent this year was a clear success, with popular alternative-rock band The Mowgli’s headlining, along with two opening acts featuring Fordham College at Lincoln Center (FCLC) and Gabelli School of Business Lincoln Center (GSBLC) undergrads. Many students took advantage of the event, raving not only about the cheap ticket prices, but also the selection of The Mowgli’s as the headliner. “It’s nice that Fordham allows its students to have great opportunities to have a lot of fun with cheap events like Winterfest. It’s really exciting,” Jean Kim, FCLC ’18, said. This enthusiasm carried into the auditorium itself, as the entire room was remodeled to resemble a typical concert venue complete with colorful lights and a massive sound system. Students buzzed with excitement waiting for The Mowgli’s to take the stage, but one factor of the evening that should not be overlooked is the incredible talent of both opening acts. The first opening act, Bleachbear, was a slow, rhythmic pop group that featured three freshmen—Tigerlily Cooley, (GSBLC) ’20, Hara Chung, GSBLC ’20, and Megan Johnson, FCLC ’20. The three performed seamlessly, with Cooley strumming the guitar and Chung and Johnson contributing their strong voices towards covers such as “Crazy in Love” by Destiny’s Child and “Take Me to Church” by Hozier, as well as some of Cooley’s original songs. The group’s harmonies were ethereal and spot on, and it was easy to tell the amount of hard work they put into both their incredible singing talent and their cohesion as a group. The Inoculated Canaries was the second opening act, a rock band whose incredible skill was evident in each of their songs. Featuring Michael Rubin, FCLC ’20, on lead guitar and vocals, Jeremy Kaplan on bass and keys, and James Terranova on drums, it was easy for the audience to pay attention to the band when their music was so exhilarating and heart-pounding. Performing a mixture of original songs and covers such as Elvis Presley’s “Hound Dog” with a modernized rock n’ roll twist, the band did an excellent job earning the audience’s praise and attention with their fast riffs, constant improvising and carefree attitude. “We were so impressed and amazed by how great and involved the audience was,” Rubin explained. 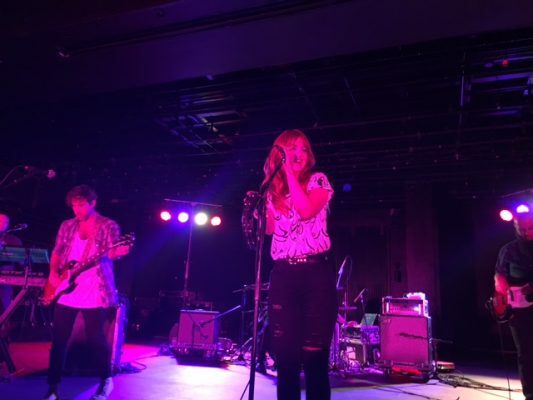 “That’s the most important part of the show—it’s not the band or how good we are; it’s how intimate the audience is, and they were fantastic.” Needless to say, after two incredible openers, the crowd was properly exhilarated for the main act—The Mowgli’s. The Mowgli’s music combines the genres of pop and rock to produce songs that are not only catchy, but carry messages of positivity and love. Drawing on their Californian heritage, their songs utilize the rhythmic strumming of the guitar and fast pounding of the drums to create an unforgettably energetic sound. “Their music is really, really fun, and it encourages us to love ourselves and one another and be at peace all the time. I just think their music is very uplifting and it is always what you need,” Chiara Camillieri, FCLC ’20 explained. The show’s setlist included songs from all three of the band’s albums—”Waiting for the Dawn” (2013), “Kids in Love” (2015) and “Where’d Your Weekend Go?” (2016)—with beats that enthused and captivated the crowd. Some tracks included “Love is Easy,” a slower ballad which encourages listeners to spread love instead of hate, “I’m Good,” a perky and catchy tune that was written for an anti-bullying campaign and promotes self-love, and “San Francisco,” an energetic anthem about living life without regrets. The band’s Winterfest performance was just as upbeat and enthusiastic as their songs. Lead vocalist Katie Jayne Earl and guitarist Josh Hogan commanded the stage, their voices powerful when paired with the music pulsating behind them. Their harmonies were seamless, and background vocals of drummer Andy Warren, bassist Matthew Di Panni and keyboardist Dave Appelbaum contributed to the strong sound emanating throughout the evening. The band was also unafraid to show their own enthusiasm along with the Winterfest crowd. Earl and Hogan’s incredible chemistry on stage was apparent in their movements, dancing and singing to each other in an excited frenzy, encouraging the crowd to move along with them. It was easy for the Fordham crowd to join in the motions, singing and shouting at volumes conveying that twice the amount of people were in the room. The environment was utterly infectious in the best way, everyone thriving from the addicting energy of their music. One massive feature of the concert was the band’s conversations with students during the performance. Earl and Hogan were extremely willing to personally discuss the meanings behind their songs and encourage the FCLC audience to take steps towards living more positive lives. “I need you all to repeat after me, ‘I’m good,’” Earl shouted to inspire everyone before launching into the hit song. Through these conversations, it is clear that The Mowgli’s not only have a talent for performing—they also have a talent for truly getting to know their audience, which made their Winterfest performance so unique for everyone who attended. Overall, this year’s Winterfest was a success, with 441 total students in attendance. Both The Mowgli’s as well as the two opening acts did an incredible job of providing an energetic and immersive experience, leaving the FLC student body excited for what is to come next year.